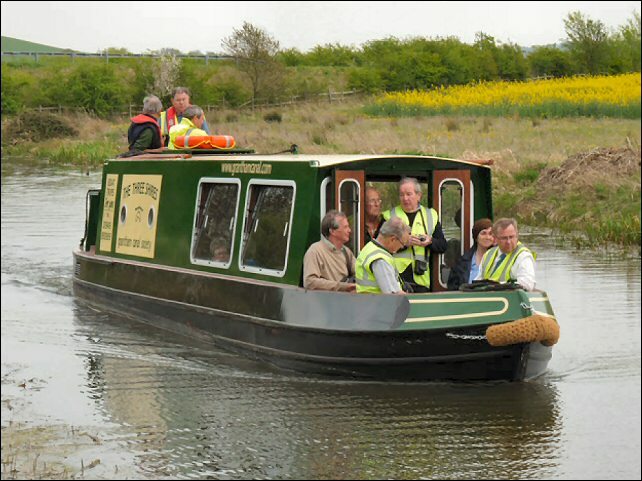 Our trip boat, The Three Shires, arrived on the Canal on 28th April. 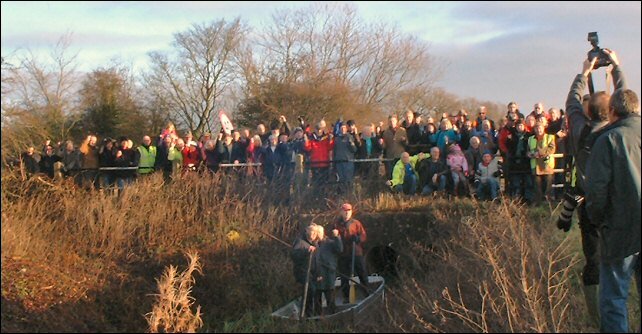 The sun was shining on the Grantham Canal for the publicity photoshoot at Mann’s Bridge. A large number of supporters turned out to express their concerns about the impact of the A46 widening scheme on Mann’s Bridge and its environs. The GCS working boat, “Restorer II” was there to symbolise the limit of navigation if the road scheme goes ahead with complete disregard to the dire situation at Mann’s Bridge. It defies all logic – why go to all the trouble of constructing a brand new, navigable bridge at the A46, only to block future navigation forever, a few hundred yards downstream? The cost of including Mann’s bridge in the A46 road widening scheme now would be insignificant in terms of the size of the overall project. But if it is not done now, the future cost of a new bridge and re profiling the road approaches, will be immense and would probably never happen because of the cost and disruption involved. Thank you to everyone who attended the photoshoot. 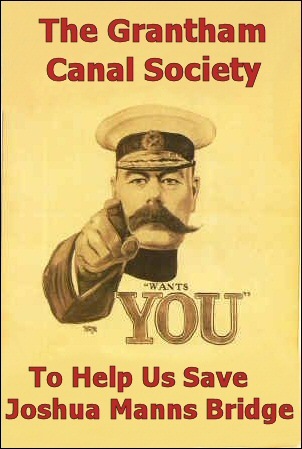 Let’s hope the “powers that be” listen to reason and do the right thing for the future of the Grantham Canal and all those that will derive enjoyment from it for generations to come. You will all be aware of the huge amount of work that is proceeding at a great pace on the new A46 and will know of the close proximity to the Grantham Canal at Stragglethorpe crossroads and the Cropwell locks, adjacent to the A46. The new high level road will have a new bridge over the dry section by Cropwell Locks, facilitating future navigable use. However, some 900 metres from the new bridge towards Cotgrave, the Highways Agency have made a catastrophic omission in their design and planning, by NOT providing for the raising of Joshua Manns bridge, number 16, and associated road works. The only way that the contractors can change the design of the road at Joshua Manns Bridge is for the Secretary of State for Transport to instruct them directly.